There are three excellent reasons to use BioBizz Top Max 100% organic flowering strengthener. First, it contains ingredients that can help increase the actual size and weight of the flower clusters. Second, nutrient uptake is improved. And third, plants grown with Top Max result in sweeter, smooth tasting crops. How it activates the flow of nutrients is essentially down to how it’s able to free up the minerals calcium, iron and magnesium in the soil, which stimulate the plant’s metabolism. 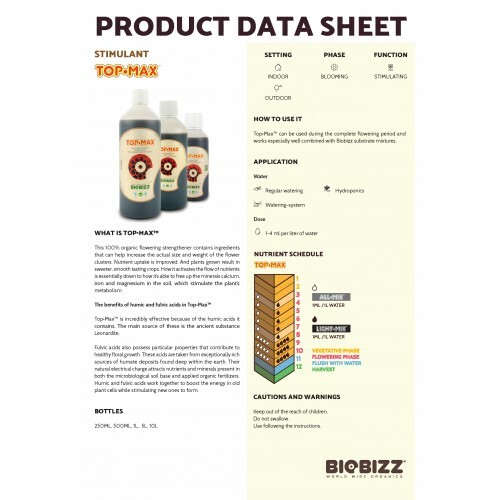 BioBizz Top Max can be used during the complete flowering period and works especially well combined with Biobizz substrate mixtures. In the first weeks of growth, we advise a dose of 1ml per litre of water. As harvest approaches and before flushing – when the nutrient solution is replaced with plain water to improve the taste and texture of the crop – the dose can be increased to 4ml per litre of water. Follow our feeding chart for the best results. 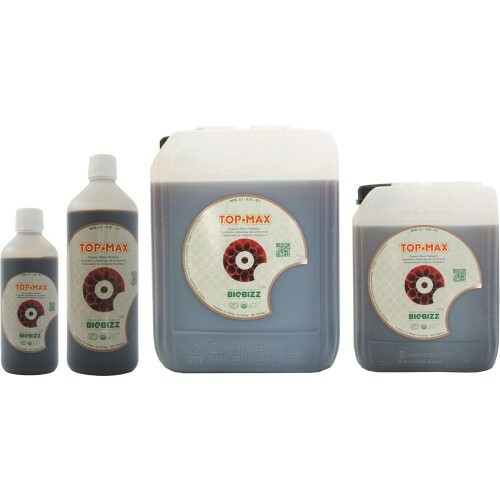 Top Max is incredibly effective because of the humic acids it contains. The main source of these is an ancient substance in the soil called Leonardite. This comes from prehistoric trees and vegetation that flourished during the carboniferous period, 300 million years ago. Fulvic acids also possess particular properties that contribute to healthy floral growth. These acids are taken from exceptionally rich sources of humate deposits found deep within the earth. Their natural electrical charge attracts nutrients and minerals present in both the microbiological soil base and applied organic fertilizers. Humic and fulvic acids work together to boost the energy in old plant cells while stimulating new ones to form.